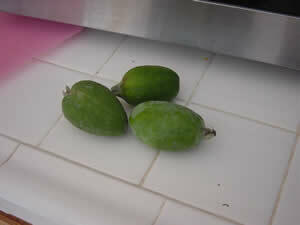 My mother has a pineapple guava tree in her backyard. It’s a nice little tree, produces quite a bit more fruit than she can handle, and the kids love cleaning out the ripe fruit that has fallen from the tree for her. They pretty much aren’t ripe until they fall, and they blend in very well with the leaves, so picking the fruit from the ground is the best way to get the good stuff. We love the guavas in our family for a few reasons. For one, they taste pretty good. Very unusual flavor. But they’re also great for handling constipation. I mean it. Don’t eat more than one, maybe two a day, or you’ll regret it more likely than not. My son has a long standing issue in that area, so he’s been enjoying the harvest daily. But we got enough that we can’t use them fast enough, so I pureed and froze the excess. It’s really easy. Slice the guavas in half and spoon out the flesh. 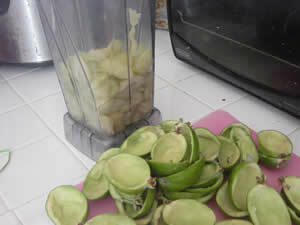 Put the flesh into the blender and discard the skins. 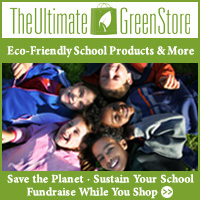 This is one of the times I love our VitaMix , although any blender would do for this job. Blend lightly. I don’t like to completely puree it – I think the cubes taste more like the original fruit if they still have some of the original gritty texture. 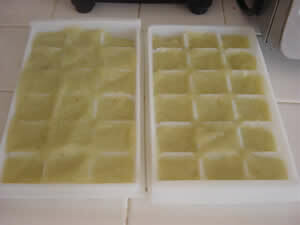 Pour the blended fruit into ice cube trays. I suggest using trays that are smaller than standard ice cubes or just not filling each cube completely. A full size guava cube might be a bit of a strain on the digestive system, if you get my drift. Freeze and use as needed. They also add an interesting touch to fruit smoothies, in moderation, of course. I can’t promise that these will cure any constipation issue, but in my experience they’re pretty powerful.